There are two groups of living jawless, elongate eel-like animals lacking paired fins: hagfish and lampreys. These animals are the only living representatives of ancient creatures that gave rise to the fish and eventually humans. Although superficially alike, hagfish and lampreys are very different: while lampreys are clearly vertebrates, hagfish should not be considered as vertebrates at all. Hagfish lack vertebrae and possess a poorly developed cranium or skull and are now assigned to their own subphylum within the phylum Chordata � the subphylum Myxine, called after the copious amount of slime (myxine) hagfish produce when stressed. 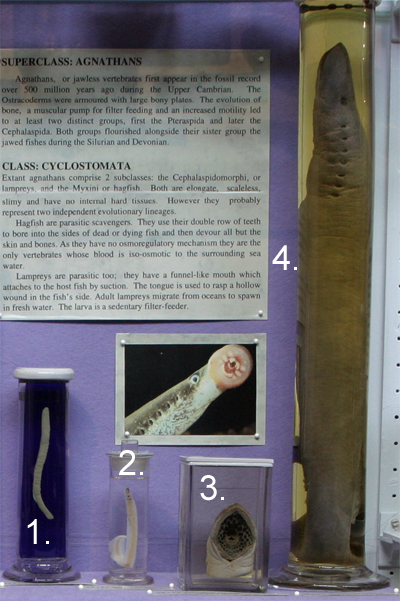 The hagfish are displayed with the fish as they used to be classified with the lampreys and extinct ostracoderms in the superclass Agnatha, a term no longer used. All hagfish are marine, feeding on invertebrates but also scavenging on dead and dying fish. The mouth contains four rows of keratinised teeth used to bore into fish devouring all but the skin and bones. Three pairs of barbels serve as tactile organs. Females lay only a small number of large eggs with small hooks on their ends to attach to the substrate and each other. The young hatch looking like miniature adults. Lampreys possess a skull, vertebrae and are assigned to the class Cephalaspidomorphi within the subphylum Vertebrata. Adults of most species of lampreys are parasitic with a funnel-like mouth that attaches to the host fish by suction. The oral disc and tongue is covered by tooth-like plates of keratin that are used to grasp the prey and rasp a hole through which the host�s tissues are sucked. Lamprey eggs develop into sedentary filter-feeding larvae � ammoecetes. The ammocetes burrow into mud and feed on small organisms with only their oral hoods sticking out above the surface. This larval stage may last for 3 � 7 years. Once the ammoecetes have metamorphosed into adults, lampreys migrate to lakes and seas to feed; marine species return to fresh water to spawn. 1. Petromyzon marinus, sea lamprey: juvenile. 2. Petromyzon marinus, sea lamprey: ammocoete showing oral hood. 3. Petromyzon marinus, sea lamprey: oral disc of adult. 4. Petromyzon marinus, sea lamprey: adult.